Camp Swatara is a family and summer camp located at the base of Blue Mountain in southeastern Pennsylvania. 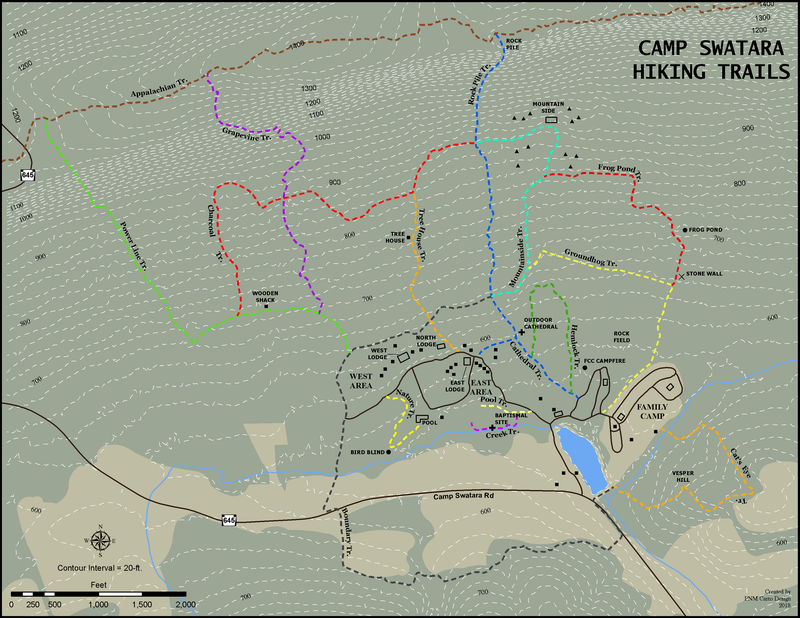 The focus of this project was to update the camp’s hiking trails map. The first step was working with the Camp and volunteers to map their trail network using Garmin recreation-grade GPS receivers. Other features such as points of interest and roads were mapped by using GPS or heads-up digitizing from orthophotography. With the data assembled, I was ready to redesign the existing map. The primary design change was adding color to the map, including symbolizing trails by their blaze. Elevation contours were added to assist camp visitors visualize the terrain of the trail network. The finished map has a modern look and a more precise depiction of the hiking trails network.